This week I bring you Suheiry's View. It's pronounced "sue-Hay-dee". It's Spanish. She is a Freelance Writer and Lifestyle Blogger with degrees in English and Fashion Design. Suheiry like's pretty things, but she talks here about something not so pretty: scars. 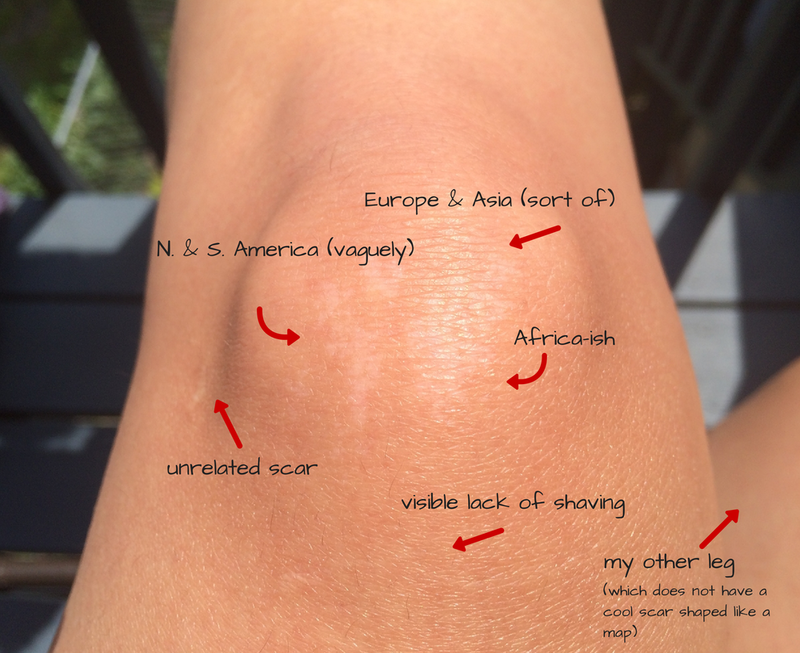 I have a 20-year old scar on my left knee that looks like a blurred map of the world. When I was 10 years old, I fell while jumping rope. I remember getting up, blood dripping down my knees, and walking back home. I remember my mother's anger, which I now realize masked the initial panic of seeing your child covered in blood. I remember her cleaning up my wounds and then telling me I couldn't go back outside. I remember crying and begging to go back outside. It was still early, and I felt fine. Scarring is a natural part of the healing process. A scar never goes away completely. Certainly there are ways to reduce its size and change its appearance, but that scar is still there, reminding one of the wound and the event that caused it. It's the same with emotional scars. Oh, these are metaphorical scars, but they too are the end result of healed wounds. They are the scars left behind by a heart broken and healed, after 10 years of pain and loneliness. They are the scars left behind by verbal and physical abuse. The kind you don't quite get over, but you manage to get around in order to move forward. These scars are emotional and internal, but they are reflected in the decisions we make, the things we do, the things we say. They are a reminder of loss, abuse and the trials of life. They are a reminder of the battles we've fought and survived. They are a reminder that we did survive. The scar on my knee has faded. It's softer, not as obvious. Like physical scars, emotional scars fade over time. They too become softer and less obvious. They never go away, and like physical scars, sometimes they still hurt. Yet they are proof that I fell, picked myself back up, dusted myself off, and kept moving forward. And I will keep moving forward, in possession of newfound wisdom, discernment, and an extra measure of caution. The scars still hurt sometimes, and they always remind me of the pain caused by the wound. Still I don't let these old wounds and scars hold me back. After all, it's still early and I feel fine.